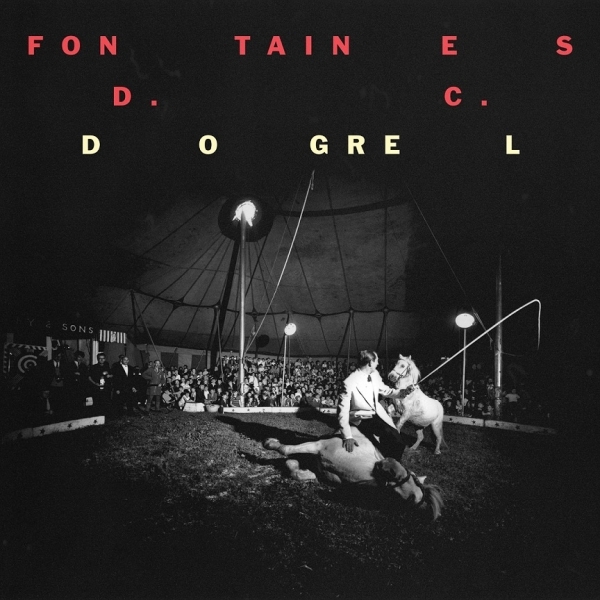 Dogrel is the debut album by Fontaines D.C., the Dublin based group who have garnered attention for their run of well received singles and a support slot in 2018 with fellow post-punks Shame. The album bolts out of the gate with the clattering drums and the bouncing bass of “Big”, which then immediately crashes into a full band assault. Whilst not strictly autobiographical, there are definite parallels of the band’s spirit in vocalist Grian Chatten’s declarations “Dublin in the rain is mine/ A pregnant city with a catholic mind” and “My childhood was small/ But I’m gonna be big!”. The city of Dublin is an overbearing backdrop in Dogrel, almost a character in itself, its songs inhabitants and the smoky vignettes all exist underneath its cloud laden sky. In Chatten the group have a compelling frontman, in comparison to the rough, barking vocals of their contemporaries (IDLES, Shame), his voice is more akin to Sleaford Mods’ Jason Williamson or the late Mark E Smith; sing/speaking in his thick Irish accent. A possible marmite factor for some, personally I find it extremely appealing, sounding enduringly genuine with a blunt, sardonic humour, his lyrics are often whirling poetic observations of disillusionment, authenticity and nationality. The influence of classic post-punk groups like Joy Division and Bauhaus is clear in the musicality, “The Lotts”, “Too Real” and “Hurricane Laughter” in particular feature quick, rattling drums, muscular bass-lines and guitars that rip back and forth like dirt bikes on a speedway. There are sombre moments too, where the instrumentation turns down a notch, “Roy’s Tune” has an early Smiths-like quality, a floaty melancholy to the guitars which works well alongside Chatten’s despondent delivery “Hey Love/ Are you hanging on?”. The album concludes on a similar note, after the penultimate throttling of “Boys in the Better Land”, Dogrel bows out with the doleful finale of “Dublin City Sky”. Fontaines D.C. choose not to finish where they began on “Big” a stomping statement of intent, instead opting for a gorgeous traditional style folk track, its doomed romance fading the album out through a last walk through the drizzling Dublin streets. As debut albums go, some shine bright on initial release to be then looked at through a side smile years later as the cracks appear, others remain under the radar only to be discovered too late, then hailed as crucial. Focusing on Dogrel, the facts are that this record is so thrilling and so enjoyable, so devoid of excess fat and equally rollicking and thoughtful that it’s hard not to imagine it not going down as one of the great debut records of the decade.